Why build a website when you can help your customers build their business. rave7™ helps you connect with your customers, by building loyalty through the services the platform helps you provide. 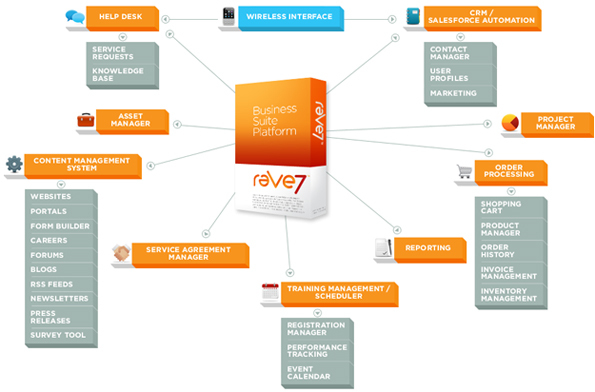 You would have to integrate more than 7+ separate systems in order to get the full functionality of rave7™. The rave7 CRM System is not just a simple contact database, but a full blown CRM. Track Accounts, Contacts, Leads, contact activity, opportunities, quotations, invoices, and so much more. It's where you can track and build relationships with your clients. rave7™ makes email marketing easy! The system allows you to keep in touch with your customers by executing email blasts, loyalty campaigns, advanced series newsletters, and auto-responders. We do all the heavy lifting so you don't have to! The rave7™ Event Manager goes way beyond simple calendar functions into full featured Training Management with detailed conflict resolution. The rave7 Project Manager allows you keep track of your work and organize it with milestones and tasks. It also includes Gantt and resource charts that help provide insights about the progress of your projects. When your clients are ready to take advantage of the mobile wave, rave7 has you covered with a complete mobile frame work built right in. Many businesses today need to leverage the Internet to boost sales, and an on-line store is a good place to start. rave7 makes it easy to build a professional looking store with all the bells and whistles without coding.